I enjoyed Evgenii Chizhov’s Перевод с подстрочника (literally: Translation from a Literal Translation) so much that I’m not quite sure how to write about it… I seem to have a particular problem writing about books I like this much, with especially particular problems when the books are as nicely composed as this one. At least I’m not alone: Leonid Yuzefovich’s summary of Translation notes that most reviews just don’t seem to capture what Translation is about…there’s just too much there and you just have to read the book. My favorite thread to pull in Translation involves Chizhov’s examination of identity: that thread intertwines with subthreads looking at doubles and various literal and metaphorical types of translation. I seem to read suitcaseloads of books about identity but Translation feels deeper—or perhaps more mysterious or lovely or down-to-earth in its metaphysicalness?—than most of my other reading. Translation gets off to a promising start. Oleg Pechegin, a Moscow poet who’s not very successfully self-published, is on a stuffy train to Koshtyrbastan, a country you won’t find in any atlas unless you’re living in Pechegin’s world. While riding the train, Oleg meets a man who tells him what he claims are truths about Koshtyrbastan—scary things like bodies being thrown into a salt lake to disintegrate—but the man quickly disappears. I had the feeling (correct, it turns out) I’d just met a human Chekhovian gun. Oleg is on his way to Koshtyrbastan to do the job in the novel’s title: turn literal translations of the Koshtyr president’s popular and influential (of course!) poetry into poetic Russian translations. Oleg goes from being a poet nobody knows or reads to a poet who’s been translated into Koshtyr. With a large print run. He now has a large house, too, as well as a comely young cook at his full disposal. All these perks come thanks to Oleg’s childhood friend Timur, who grew up in Moscow but has returned to his roots in Koshtyrbastan, where he has a high-level job and has taken a second wife. Timur has arranged everything, promising (pretty much, anyway) he can arrange for Oleg to meet the People’s Leader himself, Rakhmatkul Gulimov. Meanwhile, Chizhov mixes in flashbacks—they’re a little drawn-out for my taste, though they do end up having a place—showing Oleg and Timur back in Moscow, covering, among other things, an episode of jealousy involving Polina, Oleg’s ex-girlfriend, as well as Oleg’s friendship with a poet who dies in a fire. Lots of fine threads shoot through the novel and its account of changes in Oleg’s identity: how he does and doesn’t adapt to an unfamiliar Eastern life, how he attempts to channel the People’s Leader, how he feels his foreignness in a place where he looks painfully different and doesn’t speak the language, and how he manages to make the translations work under, well, extraordinarily difficult conditions. Many things make this novel work for Chizhov, particularly a wonderful mix of genres—existential novel, psychological thriller, love story, fantasy, political thriller, even action, with a helicopter rescue scene—that keeps things moving. I think it was Translation’s pervasive sense of creepiness that was responsible for keeping me up late reading: Koshtyrbastan’s isolation, Gulimov’s ubiquity, Koshtyrs’ admiration for Gulimov, and, especially, Oleg’s transformations as he searches for his inner Gulimov so he can complete the translations. Chizhov blends all this together beautifully: I was interested to see that his talk at this year’s “Writers’ Meetings” program at Yasnaya Polyana looked at the book “как роман о поиске вдохновения” (“a novel about the search for inspiration”). I was glad I didn’t know too much of the book’s plot before I started so don’t want to list specific ways Oleg searches for inspiration… but I will say that Chizhov incorporates various sorts of doubles and borders, both internal and external, as well as Gulimov’s idea that everyone is a poet. Oleg’s eventual and inevitable fate makes the book a wonderful cautionary tale that can be read on many levels, either as a fairly straightforward thriller or as an existential novel about a very human, rather confused, artist. In the end, perhaps the novel’s epigraph from Osip Mandelshtam—“Поезия – это власть”/“Poetry is power”—is what matters most, even if one part of me wants to say that quotation is too big and broad to sum up the book and another part of me wants to say that quotation is too small and narrow to sum up the book. Then again, I couldn’t agree more with Yuzefovich that Chizhov doesn’t offer much in the way of answers… then again (again), as Yuzefovich continues, Chizhov doesn’t ask his questions in ways that make the reader expect them. And thank you, too, to Yuzefovich for helping me understand why I enjoyed the book so much: it’s because Chizhov left me with vivid pictures and questions that still won’t leave me alone more than a month after I finished the book. At least I’m not alone with those questions. Translation is a finalist for the Big Book Award and the Yasnaya Polyana Prize and I’m very much hoping it wins something somewhere—as I mentioned in my Yasnaya Polyana post, it was probably the (prize-eligible, for calendar reasons) book I heard praised the most when I was in Moscow earlier this month. Up Next: The NOS(E) Award long list. A Moscow trip report. 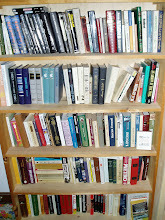 Books read in English. The Yasnaya Polyana Prize announced its shortlists today… and these shortlists sure do put the short in the shortlist. Choosing a meager four books from the “XXI Century” long list of 41 books—winnowed down from 153 nominees—feels a little sad. Then again, according to jury chair Vladimir Tolstoy, the list includes only books the whole jury could approve without serious objections. Even so, I have to wonder if the short shortlist is a reflection of what I perceive as a general lack of excitement about releases from last year/season, the crop from which the 2014 Yasnaya Polyana lists generally draw. The “Childhood, Adolescence, Youth” prize shortlist is even shorter: only three books. Winners will be named on October 21. The one book I was rooting for did make the shortlist: Evgenii Chizhov’s Перевод с подстрочника (literal title translation: Translation from a Literal Translation) is also the (2014 prize-eligible) book I heard praised most universally in Moscow earlier this month. I’ve already started drafting a post about Translation: I enjoyed it tremendously and thought it was very, very good, despite a bit of flashback-based flabbiness in the first half. Evgenii Chizhov’s Перевод с подстрочника (literally Translation from a Literal Translation), about a Moscow poet who goes to fictional Koshtyrbastan to make real poetry from some literal translations. Sergei Shargunov’s 1993, about family and events during a year I remember as memorably unstable. Disclaimers: The usual. Plus I know Yasnaya Polyana jury member Vladislav Otroshenko because I’ve translated some of his work, including Addendum to a Photo Album, which just happens to be scheduled for release March 8, 2015, from Dalkey Archive Press. I also translated a short story by Roman Senchin for the Read Russia! anthology. Up Next: Moscow trip report, including all the books I brought back. (Overweight baggage alert!) Chizhov’s Translation, some translations into English, and Evgenii Vodolazkin’s Solovyov and Larionov. I really have been reading, despite two breaks for travel and the cold that, inevitably, ensued after Moscow—I can’t wait to get caught up on my posts! I’ve prepared this post to automatically appear on September 6, when Read Russia Prizes will be awarded in Moscow, at the conclusion of the International Congress of Literary Translators. I’ll be at the ceremony and will add a comment—likely from Anonymous!—with the winners’ names. Here are lists of finalists; the award’s long list is here. Jorge Ferrer Diaz for his translation of Alexander Herzen’s work My Past and Thoughts (Spain). Elizabeth and Robert Chandler for their translation of Vasily Grossman’s book An Armenian Sketchbook (Great Britain). Marian Schwartz for her translation of Leonid Yuzefovich’s novel Harlequin’s Costume (United Kingdom). Martina Jakobson for her translation of Arseny Tarkovsky’s book A Herd of Deer (Germany). Up Next: A nap, please! And then lots of books I’ve read but not posted about during one very busy summer. Disclaimers: I work on small projects for Read Russia and know many of the translators and publishers named in these lists.